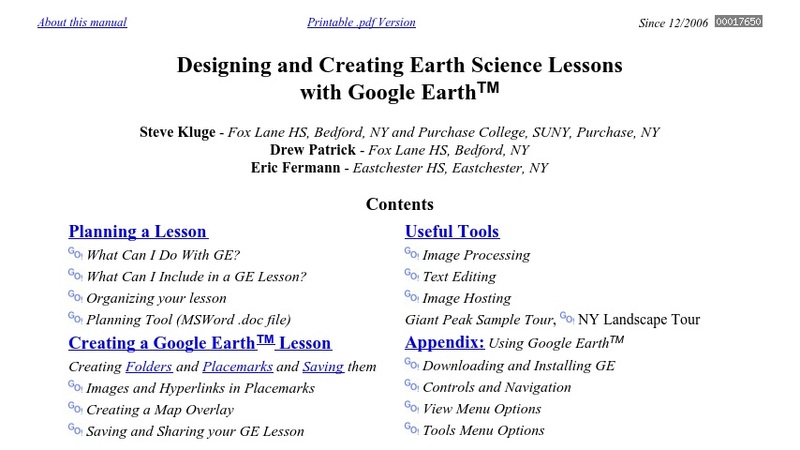 This teacher's guide provides instructions on creating Earth science lessons using Google Earth™ software. The guide, which focuses on using the free version of the software, covers how to plan a lesson (what the software can do, what can be included in a lesson) and how to create a lesson (creating folders, placemarks, map layers; sharing lessons). There are also links to useful tools for image processing, text editing, and image hosting, and an appendix with instructions for downloading, installing, and using the software. A sample "tour" is provided, and a downloadable, printable version of the guide is included.